Have You Heard Any of These Common Myths About Botox? Home > Uncategorized > Have You Heard Any of These Common Myths About Botox? At Rancho Wellness, we’ve heard every myth about Botox in the book. We believe it’s important for our clients to have as much information as possible about any procedure they’re considering. 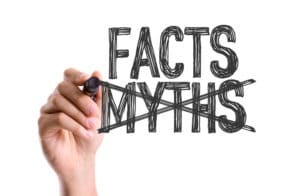 That’s why we’re presenting you today with some of the most common myths and their true counterpoints. If you still have questions – or you’re ready to visit our wellness center – give us a call at 909-483-7800. While you certainly can get Botox after lines appear, the best possible option is to get ahead of the game. It can be used not just to treat lines but as a preventative treatment. In fact, when it’s used preventively, it can help some people’s muscles to learn not to make facial expressions that can increase lines. The result? A future with less Botox. This simply isn’t true. We believe this comes from the fact it’s true that if you stop getting Botox treatments, your wrinkles will reappear similarly to where they were before. However, they won’t be worse. It is true that Botox isn’t a permanent solution – it lasts about three to four months – but if you decide to stop treatment then the muscles will slowly go back to where they were prior to treatment. Many clients ask us at what age they should start getting Botox. The truth is that there isn’t a perfect age to start. A lot depends on your wrinkles. If you haven’t started to get fine lines or wrinkles yet, then you can look to the women in your family to see when they began aging. In some cases, a person in their 30s may want Botox, while others will wait until they’re in their 60s. It’s your choice – though we’re happy to consult with you if you’re not sure if now is the time. The good news is that you can use Botox for more than just cosmetic reasons. Injections have successfully treated migraines too. How? By reducing the muscle tension, which in turn puts less strain on the nervous system. It can be used for many other purposes too, including treating excessive sweating by blocking sweat glands, and helping to treat depression. It’s true that more women than men get Botox but women by no means have a monopoly on this treatment. Men have reported that wrinkles can not only make them feel older, but can make them look angry. Getting Botox helps them to soften up their look and seem more approachable. This is helpful for men who are looking to date, but it can also be helpful in the business world too. Do you have concerns about Botox? Are you considering it but still have questions? Reach out to Rancho Wellness at 909-483-7800 and let’s get you started! We are here to educate you on your options so that you can make the best choice for your needs.